Prunus incisa 'Kojo-no-mai', or as it is more commonly known, the Fuji Cherry is an excellent subject for bonsai cultivation. It is frequently available in Garden Centres and nurseries in the UK and around Europe during the early months of Spring where it is frequently admired for its very early pink/white blossom in March. Prunus incisa is a spreading, rounded shrub (as opposed to the more tree-like habits of many other Cherry species) also suitable for use as hedging material as it responds well to frequent pruning which in turn creates a dense foliage mass. Leaves are oval shaped and can be reduced to just 1cm or less in length, showing a mid-green colour in summer followed by a vibrant orange red in autumn. Where spent flowers are left on the tree, small purple fruits appear in the Autumn. The only real disadvantage that I see with this species, is that though relatively young examples are very frequently seen for sale, it can be difficult to obtain mature specimens with a substantial trunkbase. A lack of decent trunk girth invariably requires that material needs to be greatly reduced in height for development as mame bonsai (bonsai under 6" in height). The Fuji Cherry that is the subject of this article was originally purchased in 1997 as a nursery tree for £2. It was bare-rooted and planted into Seramis (and type of fired clay I was using around this time) and grit, and then planted into a bonsai pot. This was much earlier in my own process of learning bonsai and at the time I was reasonably satisfied with the results. I was simply looking forward to the tree flowering the following year rather than concerned by what I would now consider to be a trunk that was much too tall for its girth (making the trunk look skinny and immature). March 2000: the following year the Cherry bonsai flowered and indeed the results were very pleasing. The sheer volume of flowers that appeared across the branches made a spectacular sight! I had allowed the natural upright-branching habit of the Cherry to prevail in the design of the bonsai and this produced a natural informal broom. However, the tree still looked very immature, particularly during the growing season. After flowering had finished, the 15"/37cm tall tree was simply a slender (1"/2.5cm diameter) trunk with a mass of small green leaves sat on top and was far from impressive to look at. 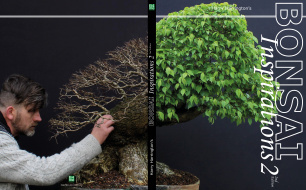 By the time flowering had finished 3 years later in 2003 I knew I had to do something about the actual structure of the bonsai to improve its appearance year-round. Late May 2003. I decided that to make the the tree look more impressive, I would need to greatly reduce the height of the trunk and then regrow the branch structure. With the trunk still only approximately 1"/2.5cm in diameter, in order to achieve a suitable trunk height-to-girth ratio of 6:1, I would need to reduce the overall height of the tree to less than 6"/15cm. So I began the process by pruning away the top of the trunk of the tree very hard and removing many of its branches after flowering had finished. I then airlayered the trunk near its base. This allowed me to incorporate the subtle bend low down in the trunk for better trunk movement, thicken the trunkbase of the new tree (through the natural tendency for the airlayer site to swell), develop a good spread of surface roots and reduce the height of the tree, all at once! As with many bonsai techniques it is subjected to, the Fuji Cherry responded well to being airlayered and by the end of June 2003 had produced a mass of new roots. The base of the tree was removed and the now much smaller bonsai was planted up into a bonsai pot.